Where should an author sign a book? By far the most common place to sign a book is on the title page. Occasionally the half-title is signed, and some authors do sign on the front free endpaper (that’s the blank page opposite the inside front cover). For what it’s worth, I’ve found when shopping at used bookstores, that author signatures inside the front cover or on the endpaper tend to get missed by those pricing the book. Over my bookselling career, I’ve found many books signed in one of those places which were not priced, or noted by the seller, as having been signed. 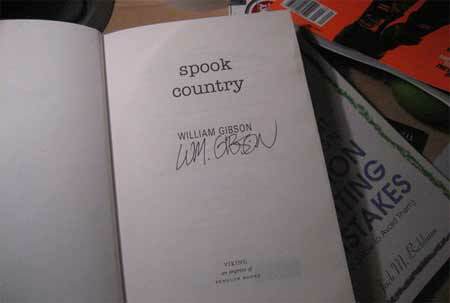 This is because it’s a less commonly signed area of the book. But really there’s no right or wrong way to do it. (Ken Kesey used to sign a book just about anywhere – the dustjacket, the cover…it was all fair game. This is why I always look carefully at Kesey books when I’m out looking for books…) Though the standard place to sign is the title page, really it comes down to your personal preference. From a book collector’s perspective, the only thing that matters is if the book is signed or not, rather than where it’s signed. If you’re signing an anthology, you have several options. You can sign the title page, or the page your work appears on. I’ve also seen authors sign next to their name in the table of contents. Editors most often sign on the title page. Please use blue or black ink; colored inks are rarely used. It’s probably best to use a ballpoint, or good quality rollerball or gel pen which will not blot or bleed through the paper. For information about different types of author signatures (inscriptions, association copies, etc. ), on our Author Signatures page. If you’re not an author, but a gift-giver wondering where (or if!) to sign a book you’ll present to someone else, please see our article about On Signing Gift Books.